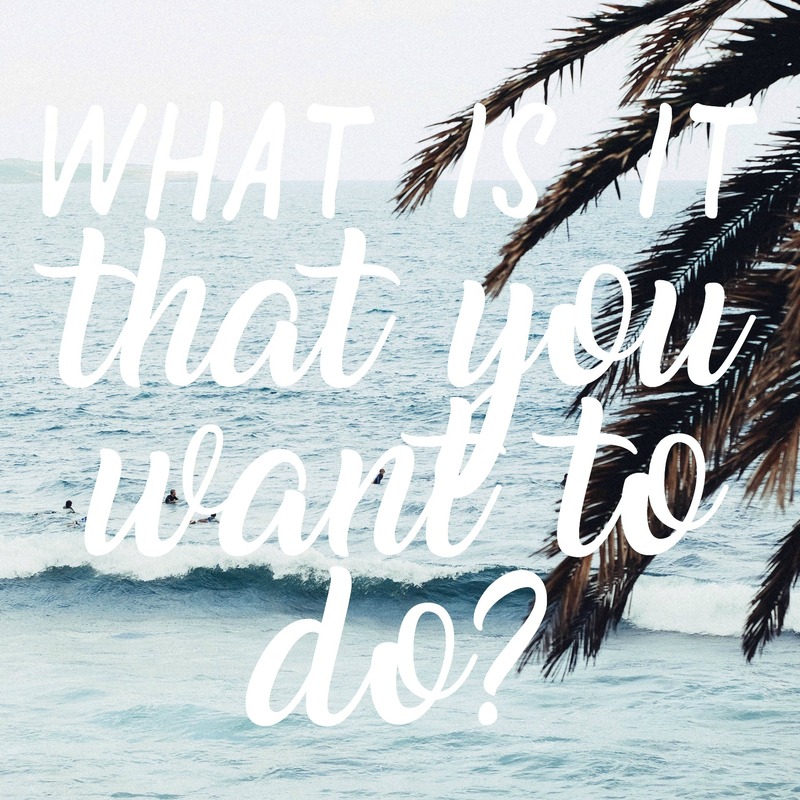 What is it That You Want to Do? | The girl who loved to write about life. That's a broad question, right? What is it that you want to do? I don't mean with your whole life. Honestly, I don't know if any of us ever figure out the one thing we want to do with our lives. Or if there even is just one thing. That's not what I'm talking about. I'm talking about that thing (or things) that, regardless of anything else, you know you want to do. We all have things that, deep down, we know we want to do. And we wait. For whatever reason. Sometimes for good reasons, sometimes for stupid reasons. We think we aren't good enough, that now's not the right time, that we should be better prepared...and we wait. Last week, someone asked me on Instagram what the secret was to blogging when you have a baby. Babies are sweet and lovely, but they are little time suckers. They have a way of making a whole day vanish before you even get started on your to-do list, and that can make things like blogging fall away. Anyway, I thought about it for a bit before responding, and I was kind of bummed that I didn't have any cool, secretive tips. I didn't even have any fun tips. So I wrote back an honest answer: I sleep less. I don't watch as much Netflix as I would like. And I do a lot of one-handed, bleary-eyed typing on my phone when Jack needs me to hold him. As I typed that out, I felt less bummed and more just proud of myself. I didn't have a secret recipe, but I was doing it. Blogging and writing are things I want to go for, so I do. I set my alarm for outrageous hours and just do it. In the most inconvenient of times. In the most sleep deprived, busy, overwhelming times. Because I want it. I'm not some huge success, but I'm going for it. Sometimes, you just need someone to tell you to go for it. To look deep inside yourself, see that thing you want to do, and just do it. Go for it. 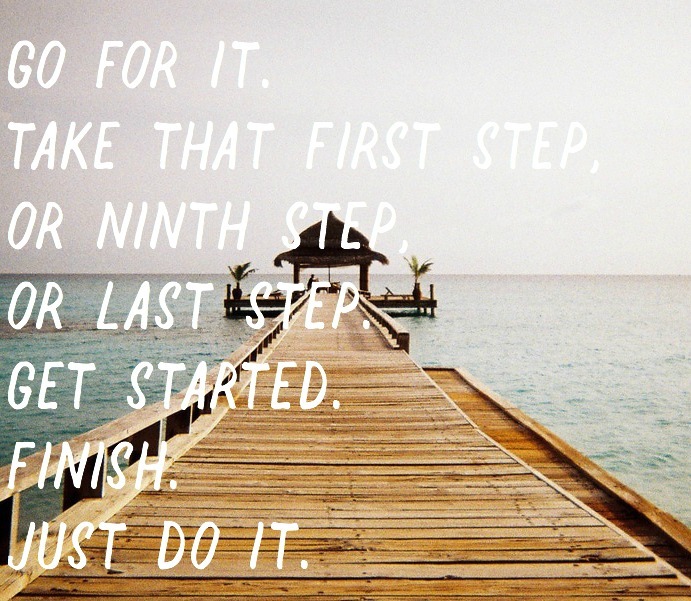 Take that first step, or ninth step, or last step. Get started. Finish. Just do it. So let me be that person for you today. Maybe I know you in real-life, or maybe we're internet friends, or maybe I'm a stranger who's words you pop by and read sometimes. Whatever it is, for today, let me be the person who tells you that you should go for it. Let me also be the person to tell you that it doesn't have to be pretty or well-executed or an instantly huge success to be a win. When you start trying, it's a win. Want to blog? You can. You might not have that pretty white desk in your own office with perfect natural light, where you get six uninterrupted hours a day to build your empire. It might look more like typing things into your phone as you get ideas throughout the day, while you're juggling your job and your kid and who knows what else, and then setting your alarm for a horrid hour so you can put those thoughts into a blog post. That's what it looks like for me right now. Want to run a marathon? BLESS YOU, I will never understand why you want to do this, but I know you can do it. Go for more walks this week. Maybe try a jog next week. Buy some new running shoes* . Just get started. Maybe you want to go back to school, or become a journalist, or get a new job, or take a new adventure, or start a new journey, or write a book, or open a coffee shop. Whatever that thing is inside of you, the thing that's always quietly (and sometimes not so quietly) there, hanging out just below the surface, begging you to take a chance....you. can. do. it. It's the first Friday in February of 2017. You'll never get this Friday back. It seems like the perfect day to get started, doesn't it? Do it. Get started. Take your first step. I'll be cheering for you all the way. *denotes affiliate link, disclosure here.